Next Advisory Council Meeting Friday, April 29, 2016 9:30 a.m. â?? 1:30 p.m. East Brunswick Public Library http://ebpl.org/main/index.cfm DDHH contact number: (609) 588-2648 Presenters: Jason Collins, MS NCSP, School Psychologist, NJ Specialized Child Study Team Wendy Eufemia, Learning Disability Teacher Consultant Topic: â? ?special education evaluation services for students in NJ who have a hearing lossâ?? All DDHH Advisory Council meetings are fully accessible with sign language interpreters, assistive listening devices (ALDs) and CART (realtime captioning). 2016 Midwestern Regional BDA Conference The 6th Biennial Midwestern Regional BDA Conference "State of the Black Health: Living Well in the 21st Century" hosted by Buckeyes Black Deaf Advocates will be held on August 5-7, 2016 in Columbus, OH. For more information including registration, lodging and schedule, visit Midwestern Regional BDA Conference website. Interpreting in the 21th Century. What Does It Mean To Me? This unique one-week leadership training program is designed specifically for deaf people of color who are interested in professional and/or leisure participation in deaf theaters. Explore the history of deaf theater and its cultural contexts Practice theatrical expression Gain knowledge and skills in actor movement Increase physical awareness for stage work Learn character development for the stage Develop play production skills Tuition: $837* Lead instructor: Fred Beam, founder of Invisible Hands, International, Inc. Registration deadline: June 6, 2016 Registration questions: [email protected] * Financial assistance is available for tuition and housing. Contact [email protected] Note: Check-in is Sunday, June 19 by noon for an afternoon orientation. Check-out is Saturday morning, June 25. 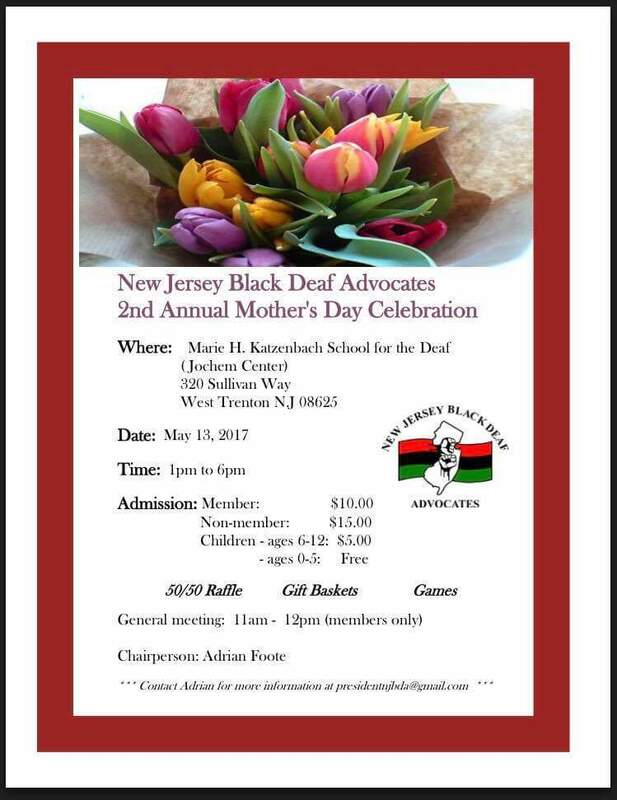 To always inform ourselves and the community about the rights and responsibilities of Black Deaf citizens; to identify, examine and disseminate information related to the impact of social, economic, educational, health, political and religious issues through the medium of panels, lectures and workshops; and to encourage increased leadership development and job opportunities for Black Deaf persons throughout New Jersey and to further their potential. CLBDA is an affiliate chapter of the National Black Deaf Advocates (NBDA) and has been advocating for the Black Deaf and hard-of-hearing community in the Chicagoland area for more than 20 years. The Kentucky Black Deaf Advocates (KYBDA) was established in June 2003 as a "Pending Chapter". August 6, 2006, the KYBDA became an affiliate chapter of the National Black Advocates, Inc. and is currently recognized as "Kentucky Black Advocates (KYBDA) Chapter #31". What Can You Do About Disability Employment? Abused Deaf Women?? ?s Advocacy Services empowers Deaf and DeafBlind survivors of domestic violence, sexual assault and harassment to transform their lives, while striving to change the beliefs and behaviors that foster and perpetuate violence. We provide comprehensive services to individuals and families, community education, and advocacy on systems and policy issues. The New Jersey Association of the Deaf, Inc. an advocacy and service organization, is the focal point of all cooperating agencies within the state in promoting the welfare of the Deaf in education measures, in employment, in legislation, and in any other field pertaining to or affecting the Deaf of New Jersey in their pursuit of economic security, social equality, and all their just rights and privileges as citizens. It's about achieving, enabling, participating, contributing, sharing, working, dreaming, creating, interacting, connecting, hoping, flourishing, excelling, living, accomplishing, touching, helping, challenging, adapting, learning, educating, feeling, ability. 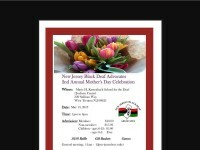 NAOBI is the only national organization that supports sign language interpreters from the African diaspora. As such, we recognize that we stand at an important crossroads. We do not stand alone. The fact that many cultures meet and converge here is what makes our existence so important. National Minorities with Disabilities Coalition (NMDC), a 501(c)3 non-profit organization, is a national response to the need for Minorities with Disabilities in America to organize around issues of mutual concern and use our collective strength to address disability issues from all communities of color. ADARA Professionals Networking for Excellence in Service Delivery with Individuals Who Are Deaf or Hard of Hearing It is a pleasure to welcome you to our website. ADARA presents an opportunity for professionals who work with Deaf people to come together and exchange ideas, suggestions and critiques regarding matters of interest to our field. We welcome your visits and your membership to ADARA. Please feel free to participate in discussions and respond to issues of concern in local, statewide national and international arenas. Above all, JOIN and PARTICIPATE. The National Association of the Deaf (NAD) is the nation's premier civil rights organization of, by and for deaf and hard of hearing individuals in the United States of America. Established in 1880, the NAD was shaped by deaf leaders who believed in the right of the American deaf community to use sign language, to congregate on issues important to them, and to have its interests represented at the national level. These beliefs remain true to this day, with American Sign Language as a core value. The Deaf Welcome Foundation was established, in 2004, to ensure the Deaf have equal access to mainstream products, services and amenities through effective American Sign Language (ASL) videos, programs and special events. TOC is where African-American, Latino, Asian, Black, Pacific-Islander, Native-American, and other ethnic interpreter communities can come together and speak on interpreting issues within their communities. . The New York City Metro Registry of Interpreters for the Deaf, an affiliate chapter of the Registry of Interpreters for the Deaf (RID), is a non-profit, non-partisan organization of interpreters, Deaf community members and allies. Members work together to ensure that high-quality American Sign Language-English interpretation services are provided with the utmost integrity and respect. Create a sense of solidarity and belongingness for interpreters from traditionally marginalized ethnic backgrounds by actively holding brave spaces for networking and professional discussion. Foster and recognize the talents within the ITOC community by seeking and prioritizing interpreters and transliterators of color as presenters during ITOC forums at regional and national conferences. Disseminate a member survey to have the ITOC membership provide feedback on the direction of ITOC for upcoming years. NBDA is the official voice of Black deaf and hard of hearing Americans - a community that has historically been neglected in terms of provision of equal access to education, employment and social services. The deaf community's own publication. NAD & Amazon.com, Inc. Agree to Expand Closed Captions on Amazon Video The National Association of the Deaf (NAD) and Amazon.com, a leading online streaming entertainment provider, have reached an agreement that will extend Amazon?? ?s ongoing captioning even deeper into its back catalog of TV shows and movies streamed through its on-demand entertainment service, Amazon Video. The Model Secondary School for the Deaf Act (P.L. 89-694) was signed by President Johnson on October 15, 1966, and in May of 1969, the secretary of the U.S. Department of Health, Education and Welfare and the president of Gallaudet College signed an agreement authorizing the establishment and operation of the Model Secondary School for the Deaf (MSSD) at the College. MSSD is now located on the eastern end of the Gallaudet University campus. Organizations which offer services to deaf, HOH, or individuals with diabilities. DDHH maintains the most central location for resources on hearing loss. The Division of Vocational Rehabilitation Services (DVRS), within the Department of Labor, helps people with disabilities to prepare for, obtain and keep a job. DVRS has offices throughout the state staffed by experienced rehabilitation counselors who help thousands of persons who have physical, mental, emotional or learning disabilities and need assistance obtaining or maintaining employment. The Progressive Center for Independent Living, Inc. (PCIL) advocates for the rights of people with disabilities to achieve and maintain independent lifestyles. Through promotion of choice, self-direction and inclusion, PCIL works with people with disabilities and their families to ensure the same freedoms and civil liberties as everyone else. One stop center for jobs, training, schools, vocational services. You may be eligible for free or no cost medical insurance. DVRS assists persons with disabilities to find and maintain employment. Need tutoring to improve your sign or interpreting skills?